You are here: Home / Blog / Why Am I Not Losing Weight? One of the biggest questions that we struggle with when it comes to weight loss is, why am I not losing weight? After all, we turn to diets and health interventions as ways to lose weight and get healthier, yet, those approaches often don’t seem to work. Why is that and what can we do about it? As you can probably imagine, the answer to these questions isn’t simple. You just have to look at society to know that. So many people actively try to lose weight and to get healthy, yet relatively few succeed. There are approaches that do work for losing weight, both in the short-term and in the long-term. Those concepts are what we are going to look at today. For most people, a diet does work as a way to lose weight, in the short term at least. But, there are some cases where people find that they can’t lose weight, regardless of what diet they follow. There are a number of possible reasons for this and I’ll cover some of these here, along with ways to get past them. Food can be incredibly deceptive and this can majorly sabotage weight loss efforts. There are a lot of different foods out there that look and sound healthy but actually aren’t that good for you at all. Likewise, some food choices might be great for nutrition (like tart cherry juice) but you have to pay close attention to the calories they contain. One way around this is to follow a diet approach that involves calorie counting (or some variation of this, like Weight Watchers). You don’t have to follow this type of diet long-term but following it for a little while can give you a much better idea about which foods are actually healthy and which ones are not. Alternatively, simply keeping track of the calories in the food you eat can help you to be more aware – even if you don’t try to stay under a certain amount of calories per day. Most people are in the habit of snacking at least once per day, often several times. For example, you might have a snack between breakfast and lunch or between lunch and dinner, especially if you’re feeling a bit hungry. Likewise, you might have dessert some days or even a little something a few hours before going to bed. Those habits make it very easy to eat more than you realize. That’s even true if your snacks are healthy because the calories do add up. Many of us also find ourselves justifying a treat here and there because we’ve been doing so well on our diets. That’s fine, in theory. However, often you may find that you are having treats more than you should be. The site 12 Minute Athlete talks about this pattern - and how you can sometimes gain weight even if you're eating healthy food. This is another reason why writing down what you eat is such a powerful tool. Simply increasing your awareness of what you eat goes a long way in helping you to control your habits. There is some evidence that our bodies may have a biological norm that they try to keep us to. This concept is referred to as set point theory and it is highly controversial. Basically, the theory suggests that our body uses tools like metabolism and potentially even cravings and hormones (like leptin) to make sure we remain within the specific weight range. Now, there are some arguments that the set point can be changed and it certainly is possible to lose weight regardless of what your set point is (1). However, the concept of a set point may help to explain why it is easier for some people to lose weight than others (2). Realistically, there isn’t enough evidence yet to truly know whether set point is a real pattern (3), but the topic is still worth considering.The site Mirror Mirror offers more insight into the concept. Regardless of set point, the human body does have a tendency to resist weight loss efforts (4). This pattern makes a lot of sense biologically because our bodies are trying to make sure we don’t starve. That issue may be one reason why losing weight slowly and changing your lifestyle is more effective than following a diet. There isn’t an easy solution for fighting your body when it comes to weight loss. However, being aware of this issue is important. If you pay attention to the way that your body responds to weight loss attempts you may also be able to discover approaches that work effectively for you. For example, some people find that their body responds better to a low carb diet than to a low-fat one. Likewise, autophagy diets work well for some people. This one might come as a surprise. Traditionally, cardio exercise has been promoted as the best way to lose weight, rather than working with weights. In fact, people often steer clear of weights because they don’t want to bulk up. But, exercising with weights doesn’t actually mean you are going to get large muscles. That would only really happen if you intentionally worked on doing that. Instead, weights help people to become more toned. Weight work is especially important because it helps to alter the composition of the body. In turn, this may help with metabolism and also helps to get around the health risks associated with the concept of skinny fat. In fact, the process of building muscles has even been associated with increased life length (5). On a side note, you should start paying attention to your measurements as well as your weight when you work with your muscles. Your weight alone is an unreliable measure of your success if you are building muscle at the same time as losing weight. Many of us assume that weight loss involves eating as few calories as possible but that’s not always the case. In most cases, successful weight loss is as much about what we eat as it is about the calories. One especially significant area to consider is protein. Protein plays a key role in muscle development and it’s also very important for health in general and for weight loss (6). 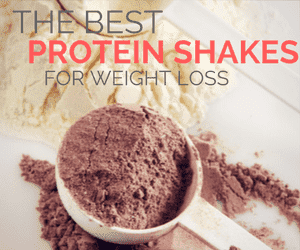 The role of protein in weight loss partly comes from the way it helps people to feel full. For example, if you eat a high protein meal, it will typically take you longer to feel hungry again than if you ate a low protein meal. That’s critical for weight loss. In fact, being hungry is one of the reasons that people struggle to follow diets and stay healthy. After all, you’re much more likely to snack or eat an unhealthy meal if you’re hungry. There are lots of examples of healthy ways to include protein in your diet but one good example is eggs, especially when it comes to breakfast. Some people also turn to protein powders, which can be especially relevant if you are short on time. Your struggles with weight loss may be caused by a range of factors, such as the food you eat and your exercise habits. For many people, one of the first steps is to pay more attention to exactly what is in your food and figure out which food is actually healthy. One growing perspective is the idea that you can’t lose weight on a diet. There was even a very popular article in the New York Times which made that precise claim. In some ways, the concept is actually true – although the phrase itself is pretty inaccurate. First of all, you can lose weight on a diet. Lots of people do. The problem is that the weight doesn’t stay off. One estimate suggests that around 97% of people regain all of the weight they lost (and sometimes more) within 3 years after a diet (7). So, if you’re asking ‘why am I not losing weight?’, you’re certainly not alone. There are a lot of people out there that simply cannot lose weight and keep it off. That pattern certainly suggests that diets don’t work and to a degree, that’s accurate. But, it only shows part of the picture. For one thing, when researchers look at the effectiveness of a diet, they typically select a group of people, put them on a diet and look at the weight loss immediately and/or over time. There are variations, of course, but that is the general concept. One issue is that we are all individuals. We all have different needs psychologically and physically. So, sticking a bunch of people on a given diet is never going to be especially effective. The diet might be a good fit for some of the people in the study but it probably won’t be suitable for most of them. Additionally, experimental studies into weight loss tend to attract people who want to lose weight (no surprise there). On average, they will also attract people who have failed their weight loss efforts in the past. It’s fairly easy to see how that could bias the outcomes of the study somewhat. This certainly means that there is more to diets and weight loss than research suggests. Regardless of the statistics for diets, weight loss is still a very achievable goal. People do lose weight and many do successfully keep that weight off. But, this often doesn’t happen through diets – not in a conventional manner anyway. Despite all the hype that surrounds them, diets are incredibly ineffective as weight loss tools. That's one reason why so many people try to follow a diet but do not lose weight in the long-term. For most people, diets probably don’t work as a tool to lose weight. By their very nature, diets are a short-term approach and they are often fairly intensive. For example, the 3-day military diet places people on a very low-calorie diet with specific food to eat for each meal. In theory, people follow that diet for as long as it takes them to lose weight. In practice, most people probably can’t keep to the diet for very long. Research might show that most of the diets we follow fail, but that doesn’t mean weight loss itself is unachievable. More than anything, it’s about altering your perspective. With a diet, you are trying to lose weight, often fairly quickly. I mean, a lot of diets even boast about just how quickly you can lose weight. Likewise, you see shows like The Biggest Loser, which emphasize the importance of losing weight quickly. And yes, you can lose weight quickly on a diet. Realistically, most diets will make you lose weight, even ones like the Clean 9 Diet or the 3 Day Diet. But, what good is that if you can’t keep the weight off? In fact, cycling between weight gain and weight loss is likely to be worse for your body than just keeping the weight on to start off with. To lose weight successfully, and keep it off, there are a few key things that you need to consider. These can make a huge difference in how effective your weight loss is. One of the biggest problems with diets is that they end. In fact, most of us going into a diet knowing that we will only be following it for a while. This means that even if a person manages to consistently follow a diet, they will still stop once they lose the weight. That pattern is one of the key reasons why people gain the weight back to start off with. Because of this, effective long-term weight loss requires a change to your lifestyle, not just your diet. Your lifestyle encompasses a range of different things, including the food you eat, the way you approach food, how you exercise and your habits. A lifestyle also tends to be less intensive than a diet. For example, a diet to lose weight might involve actively counting calories and trying to keep your calories count below a certain amount every single day. In contrast, a lifestyle may involve having a rough idea of the calorie count of your food and focusing on eating healthy and low-calorie food most of the time. You might write down your food but you probably wouldn’t obsess over the calories. Exactly how a diet and a lifestyle look is going to depend on the individual. However, a general concept is that a lifestyle should be something you enjoy, not torture. After all, you should be able to follow it consistently throughout your life. As you can probably imagine, this also means that lifestyles are highly individualized (which I’ll come back to in a little bit). For example, I love red meat (which also has surprising health benefits), so I would be extremely unlikely to be a vegan. Unfortunately, the idea of following a lifestyle rather than a diet is still fairly unpopular. Much of that comes from the fact that people are looking for fast results, while weight loss through a healthy lifestyle is often slower. Don’t let that put you off though. It’s much better to lose weight slowly and keep it off, than lose it quickly and then put most (or all) of it back on again. Additionally, losing weight slower may also provide less of a shock for your body. That may make it easier to get around any issues with your body fighting your weight loss. An important part of your lifestyle is your habits. We all have habits. They’re an integral part of who we are. Our habits also influence us much more than we often assume. When it comes to food, our habits often come from society. For example, many of us tend to eat food without thinking about it. Often this may even include eating dinner in front of the television or eating lunch while we are working. That practice is actually really unhealthy. Ideally, we want to change our habits so we can change our relationship to food. One key idea here is the concept of mindful eating. Mindful eating suggests that we pay more attention to the food we eat. Doing so includes taking the time to savor our meals and to actually enjoy the food. There are a few advantages to this concept. One is that it makes eating more special and that can help to break some of the unhealthy relationships that we have with food. Another advantage is that we are eating slower. When we eat slower, we give our brains more time to process signals. This means that we can actually stop eating when we have had enough. In contrast, people normally tend to eat whatever is on their plate, which will often mean they overeat. The significance of mindful eating is one of the reasons that the Japanese approach to food works so well. For some people, mindful eating coupled with healthy food is enough to promote weight loss – although that’s certainly not the case for everyone. Other important changes to your habits include decreasing your portion size and stopping eating before you are full. Realistically, we tend to eat more than we need to during most meals, because we eat until we ‘feel full’. But, in most cases, we’re better off stopping before that point. After all, if you find that you are still hungry, you can always go back for seconds and that’s much better than eating too much. One final change is to find ways to reward and/or comfort yourself that aren’t food-related. Food has a strong emotional significance for most of us and that can easily lead to us consuming too much. Yet, there are often other ways to elicit a similar emotional response. Finding other approaches for achieving this is a critical component of successfully cutting down our food intake and losing weight. We know that our bodies respond differently to food, as do our minds. Many of us even have specific foods that often trip us up when we try to lose weight. For some people, that might be chocolate or chips, while others might end up eating pizza far more often than they should. Other people mightn’t have a specific food at all. Instead, they might tend to eat too often or eat too much at meals. With all of the differences between people, it shouldn’t be surprising that effective weight loss should be personalized. For example, there are a lot of different lifestyles out there that do work well for weight loss and health. Some people follow the Paleo diet religiously, while others may be vegan or even follow a raw diet. Likewise, others choose specific eating patterns, like intermittent fasting. Some of the habits that I mentioned earlier can also be significant, such as mindful eating or finding a way to consistently lower your portion size. Ideally, you want to be following a healthy lifestyle that is realistic and relatively easy for you. Take whole foods diets, for example. This is a type of diet that emphasizes food that you cook and tries to cut down on additives and processed ingredients as much as humanly possible. At the same time, many people following the approach focus on enjoying their food and creating amazing dishes. For example, many of the dishes on my roundup about asparagus would be considered part of a whole food diet. A diet like this is really a lifestyle and it wouldn’t be torture at all. In fact, you’d probably find that the food you eat tastes better and is healthier overall. So, you’d end up getting healthier and losing weight, while also enjoying your food. But, that approach doesn’t work for everyone. This lifestyle does involve buying fresh and whole food, some of which can be expensive, so it might not work well for a person on a budget. Likewise, cooking the meals would often take time, (the same is true for Paleo) so, the approach probably wouldn’t work well for people who are extremely busy. In contrast, another approach is intermittent fasting. There are a lot of variations to this approach but the basic concept is that hunger isn’t a bad thing. Some versions of the diet may mean that there are some days where you eat hardly anything and other days where you are mostly free to eat as you choose. Other versions involve eating between specific hours in a day. For people who are busy, this lifestyle can work well. In fact, many people find that intermittent fasting is pretty easy once you get used to it, and it can be effective as a long-term lifestyle. I could give many other examples, but I’m not going to. If you’re asking, ‘why am I not losing weight’, the simple answer might be that you’re trying to follow an approach that simply doesn’t suit you. At the end of the day, whatever approach you take towards losing weight needs to be something you can consistently follow, to some degree or another, for the rest of your life. Successful weight loss involves a lifestyle, not a diet. It's also important to change your habits and figure out an overall approach that works for your own needs. There is one final thing I want to mention when it comes to weight loss, which is the psychological side. We live in a society that is obsessed with food and a lot of that food is high in sugar, salt and fat. We see advertisements for that type of food all the time, far more often than we see advertisements for anything healthy. At the same time, some unhealthy food is often marketed as healthy. In fact, people often don’t have the knowledge they need to make healthy eating decisions. These factors mean that our society promotes obesity and overeating. So, it’s no surprise that people struggle with their weight. Despite this, our society also heavily promotes an ideal body type and shames those who are obese. I’m sure I don’t have to give examples of this, as we have all seen and heard this pattern. Society also promotes the idea that overweight people are lazy and have no self-control. This includes a strong focus on bullying and trying to shame people into weight loss. Realistically, trying to shame a person into weight loss is never going to work and in many cases, they may end up turning to food as a comfort. After all, society has hardwired us to look at food for emotional support and that association is incredibly difficult to break. The site Psychology Today goes into the concept of emotional eating in more detail, along with what the pattern means. Losing weight is hard. Keeping it off is hard. There are some lucky people out there that don’t struggle with their weight but that doesn’t mean anything for the rest of us. Many of us also get trapped in a mentality that weight loss doesn’t work. It’s hard to think anything else when you see statistics like ‘95% of people fail at diets’ (8). But, that’s not the truth. Yes, people routinely fail at diets, or they regain the weight shortly afterward. That shouldn’t be a surprise as diets tend to be unrealistic right from the beginning. However, those statistics entirely ignore the number of people who successfully lose weight by making healthy changes to their lifestyle. And, making small lifestyle changes really is how people do lose weight successfully. So, don’t feel guilty because you struggle to lose weight. Instead, focus on finding a lifestyle approach that works for you. Doing so might take time but the process of weight loss becomes so much easier emotionally once you find your own approach. And, if all of that sounds too big and too scary… start small. Find one change that you can make in your lifestyle. When you’ve mastered that, find another. Don’t worry about what it looks like to people on the outside – figuring out what works for you is what ultimately matters. Despite what society implies losing weight is not easy, and you shouldn't feel guilty for struggling. If, you fall into that category one simple approach is to start small and find simple, healthy changes that you can make. The question, why am I not losing weight, is a complex one, because there are so many different answers. Additionally, some people are asking about why they aren’t losing weight while others are more interested in why they can’t keep their weight off. In both cases though, the issue really comes down to your own needs and your lifestyle. Despite all of the hype out there, most diets simply don’t offer the long-term outcomes that people are looking for. Instead, they are a recipe for disappointment and tend to feel like torture when you are actually following one. With that in mind, it isn’t surprising that most people simply don’t succeed with diets. So, why are you not losing weight? The answer may be as simple as the fact that you are trying to diet, rather than choosing to change your lifestyle. Weight loss is a huge industry, with no shortage of bold claims. But, long-term weight loss doesn’t come from a crash diet or a popular fad. Instead, it is connected to sustainable habits and healthy foods. Check out my most recommended products and guides to see where you can get started. What would changing your lifestyle look like for you? If you can, please let me know one change that you would like to make to increase your health or weight loss success.